The amount of feedback is based on the volume of requests. As a result, feedback is generally less comprehensive than what you’d get at an in-person appointment. Specialists respond typically respond between 2-3 business days, depending on demand. Please also be aware of limitations on feedback due to the medium & request volume (see below). If these steps are not followed, there will be a delay in response time and follow-up questions will be necessary. The form is required for each online consultation. Please note that services are for currently enrolled undergraduates only. We will discuss one essay per email consultation. If your paper is longer than 6 pages, indicate which section(s) you want to focus on (totaling no more than 6 pages). If no pages are specified, we will focus on the first 6. Additional examination will depend on queue volume. Feedback will be more focused and useful if you specifically identify what you want a Writing Specialist to pay attention to. The following are not specific requests: “Grammar,” “content,” “revising,” and similar global terms. 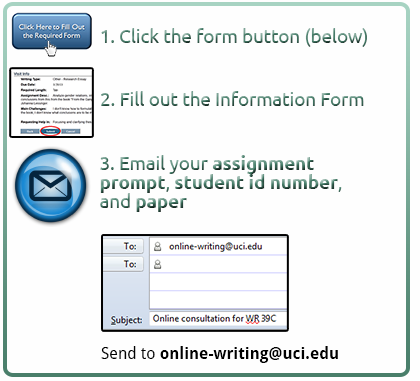 For multiple submissions of the same assignment, we expect substantial revisions between submissions and may ask you to revise further before re-submitting. Repeated requests for grammar feedback on the same assignment may be denied. However, if you have further questions about the general grammatical concepts raised in our feedback, feel free to ask away.